Become a pro at soccer with the Action Soccer Game. Designed for ages 4 years and older, this motorized soccer game features 2 modes of play (beginner and advanced) and can be played indoor or outside. Kick the soccer balls in as the goal moves from side to side! 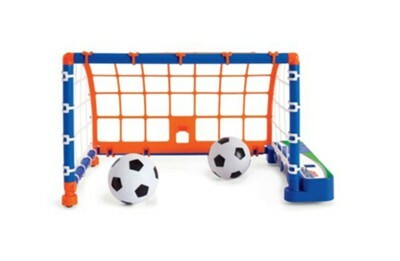 Can be played with 1 to 2 players; includes a motorized moving net and 2 balls. A fun way to get kids moving! Requires 4 AA batteries (not included). Package measures 18"W x 5.5"D x 16.1"H.
I'm the author/artist and I want to review Action Soccer.